This page contains information relevant to clinicians and practitioners practising in aesthetic medicine. Dr Anushka Reddy graduated from Wits University in 1997 and has been in the medical profession for 18 years, including fifteen years of cosmetic dermatology practice. She is the owner of Medi-Sculpt, an aesthetics clinic providing non-surgical cosmetic treatments and minimally invasive procedures. She is also founding member and President of the South African Association of Cosmetic Doctors (SAACD) and the Scientific Director of Cosmedica (the Cosmetic Medicine Congress of South Africa). Dr. Reddy is a certified Radiesse and Belotero trainer as well Botulinum Toxin injections regional trainer. She provides Cosmetic Doctors in South Africa and across the globe with technical and practical knowledge in the art of aesthetics and injectables. She now divides her time between her medical practice, teaching, training and, as the President of the Cosmetic Doctors Association of South Africa, attending regular cosmetic dermatology conferences to give talks on the latest in aesthetics. “Cosmetic dermatology is an interesting combination between the art of beauty, and the science of medicine. I strongly believe that the best cosmetic outcomes are natural and aim at improving and enhancing my patients’ sense of self and well-being”, she states. 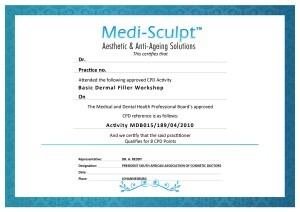 The Basic Introductory Training Course is for doctors and dentist wanting to learn the basic theory and practical use of Botulinum toxin and Dermal fillers. Please select a document from the list below to view/download.